Here is a video explaining in full detail all the options. A text version of video is also included below. A website may be built from scratch using PHP, ASP and Node.Js. Naturally building these websites would either require an in-house website developer or should be outsourced to web designer. Which of the coding platforms – PHP, ASP or Node.JS you opt for would depend largely on the preferences and comfort levels of the developer in your team/ the web designer that you hire. PHP is one of the most popular scripting languages, while Node.JS is the newest website runtime environment which has seen massive adoption for websites. Alongside choosing the language, you would need to setup the server and database as well. For building a large website you can use a custom solution with a dedicated server on Amazon Web Services. For single-website usages (the more likely scenario) for E-learning websites, you can opt for shared web server hosting, using for example GoDaddy. Since your website is being built from the ground up, you have the widest possible options for customization for features that you wish to incorporate. For instance, as a security mechanism against sharing of login credentials, you may set an upper limit on overall time a student may be logged in to the system. Such a solution can be implemented while building the website code. One thing that you should make clear is to ensure that the code is well documented. Good documentation ensures continuity between different developer teams. Such a solution would require a dedicated development team to build. Support and maintenance are also additional issues that you would need to work on. 1,000+ expected annual users – You would be able to incorporate features specifically on the basis of user requirements. It is important to make sure that appropriate security features are installed in the website framework. Such an option mainly requires familiarity with the CMS interface. These skills can be learnt quite easily by beginners. A number of our clients – independent artists and individual teachers – have easily setup their WordPress and Moodle websites for hosting their E-learning courses. There would be a one-time effort in setting up the server though. Moodle is an LMS, and is therefore designed as an E-learning platform. WordPress on the other hand is a Content Management System, to which you can add LMS functionality through WordPress plugins. 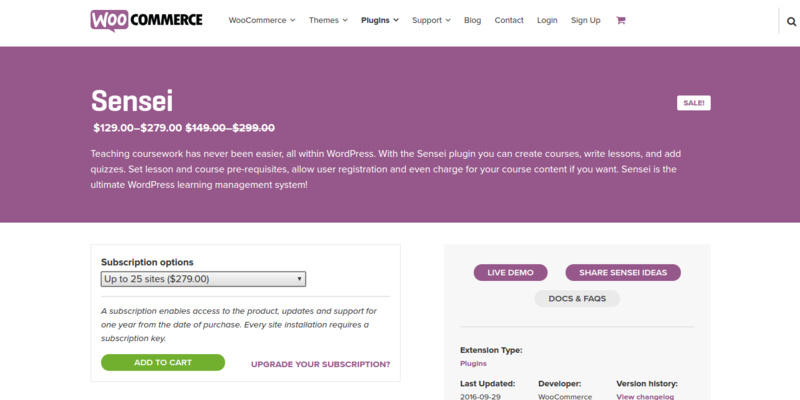 Costs of building websites on Content Management Systems include cost of plugins for adding functionalities. WordPress and Joomla offer plugins such as Sensei, Guru and eMember, which simplify the process of course-creation considerably. Many of the useful plugins available are paid, while a lot of them are free as well (generally free plugins offer specific solutions, while paid plugins bundle a whole lot of useful features together). Cost-wise this is the cheapest solution, as the CMS itself is free – the only costs are the plugins and the server hosting. Expect a time to launch between 15 to 30 days for a fully functional CMS hosted site. Such a solution would work pretty good upto a number of 10,000 students. There is no lower limit to the number of students, as costs are low. In this solution the website hosting company uses a basic website template that they use. Such a website would follow a basic template, and there are not many options to customize additional features. The cost of building such a website include purchasing the website template and server hosting. Fast – You need very little time to deploy such a video hosting solution. Server setup and configuration of the website would take time between 7-10 days. Implementing such a website is best for the case of fast-deployment of your e-learning platform. Because time of launch and costs are priority in this, such a solution would be appropriate for upto 100 users paying for the course. Beyond this number this solution fails to add the customizations you need to cater to the growing list of users. 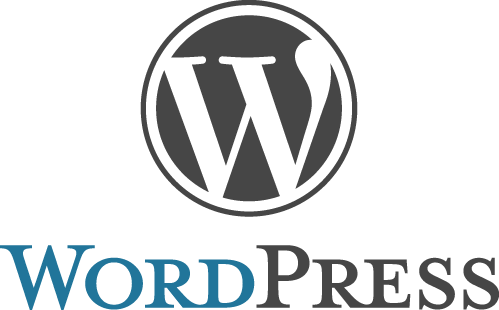 Teachable and WebAnywhere offer ready-to-use E-Learning themes, Student management options, Media and text addition, Membership Access, Server hosting and Database management. 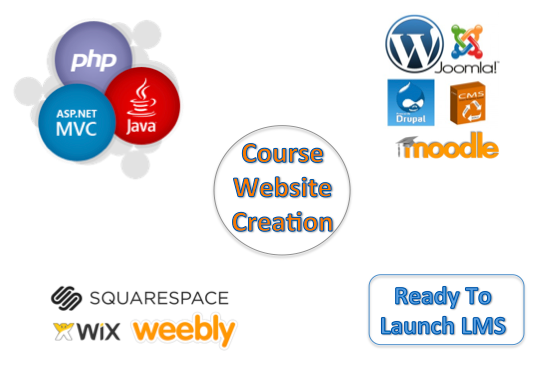 The features that these sites offer are sufficient for most e-learning website creators. These sites however are not very customizable in terms of additional security features or tweaks in User Interface. UI additions such as adding comment sections to pages, and security restrictions such as restricting login time on page, are not available when you opt for this solution. Costs are dependent on the features you integrate, and the number of students enrolled. 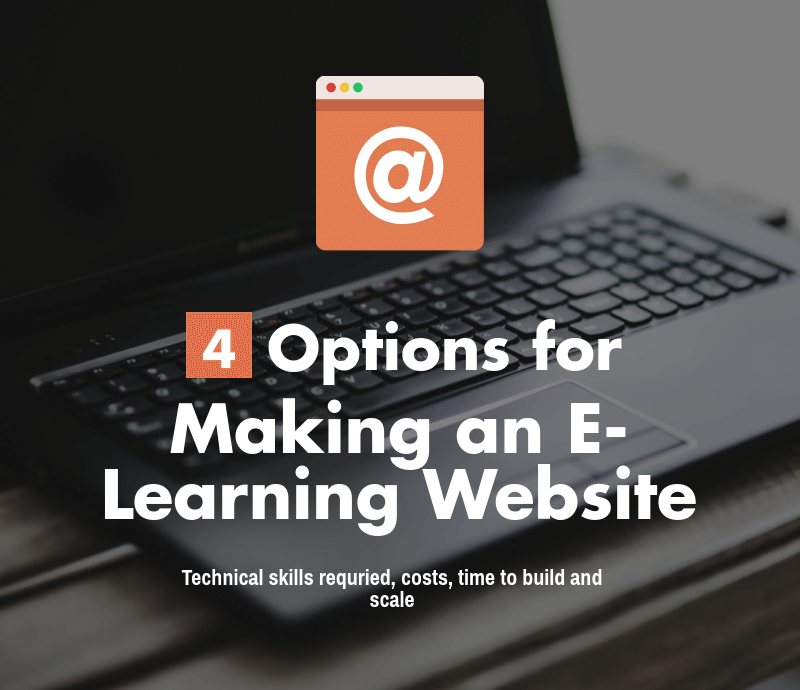 Because the websites are designed specifically for e-learning such a solution is somewhat more expensive than the case of ready-to-make websites. Such a website solution would be appropriate for upto 1000 annual users. This is the approximate number of students you can manage without the need to alter your User Interface and backend. Beyond this number you should explore CMS hosting or creating your own website. When you set about creating an e-learning website I recommend that you check other websites in similar areas. You can use the tool BuiltWith to analyze the tech stack on which any website is made. If you find that 8 out of 10 of your competitors use a particular tech stack, then implementing that stack would be the most reliable way to build an e-learning site. Video streaming and safeguarding the video content from piracy is a major technical challenge, which the 4 options discussed do not solve inherently themselves. Most of E-Learning sites use some premium video streaming provider to cater to their streaming needs. Streaming bufferless for HD worldwide and ensuring smooth delivery to regions in Africa and India with slow connections is a major problem. YouTube is quite good in this aspect, but lacks business friendly customization. Vimeo has a B2B offering that is quite popular and is okay in terms of streaming experience. YouTube and Vimeo use standard streaming protocols to deliver video content, and thus a lot of free plugins and downloaders are able to grab and download the videos. For this reason, a more custom video player, providing higher security and flexibility to manage video related features, is needed for premium videos. Here is the link to implement and compare secure technologies used in video hosting for education. 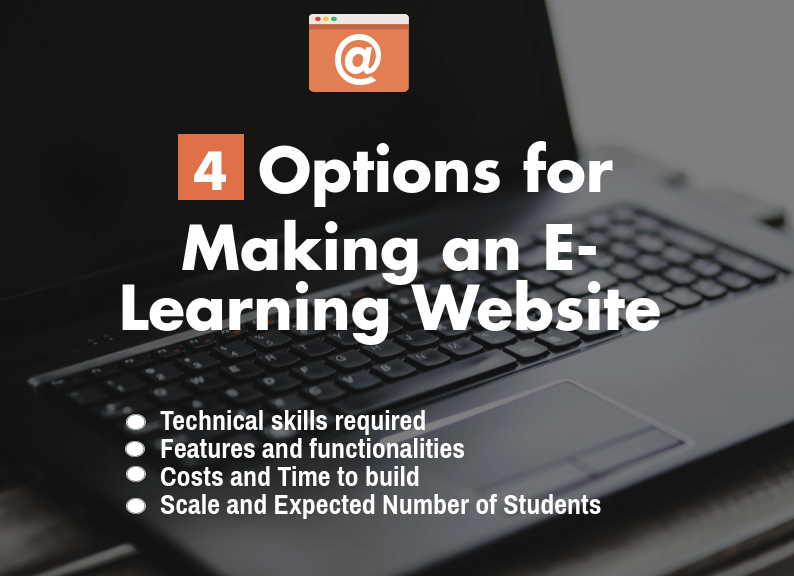 Many of the top e-Learning companies either go for a combination of the above solutions or build proprietary systems of their own (for example Udemy and BYJU’s). I will be happy to have feedback and questions in the comments section below or on my LinkedIn profile. You can also share your experience with above technologies and any interesting insights.